By the end of the summer when the new nighttime drama “Revenge” finally premiered on ABC, I was so sick of the endless commercials for it that I nearly didn’t watch. The only reason I tuned in was because there were fleeting images of beach houses with amazing woodwork in the ads that I wanted to see more of. And boy, am I glad I did. They did a great job of giving the set the same overall look and feel, though. I bet most people didn’t notice the changes. One of my readers informs me that “most of the locations were filmed just south of Wilmington, in Southport and Oak Island. Tracked down one of the sailboats, ‘Carolina Breeze,’ which is moored in Southport. The sailboat ‘Amanda’ was renamed for the show. There’s also a scene in the pilot that was filmed at Fishy, Fishy, a local cafe in Southport.” Thanks for the local scoop, Maggy! Like I said, the pilot was filmed in real houses in North Carolina. This one is in Landfall, a community on the Intracoastal Waterway in Wilmington. Interior designer Elizabeth Sheats tipped me off that it was featured in the Wrightsville Beach Magazine. The other two rooms they filmed in were the master bedroom and bath. Head over to Wrightsville Beach Magazine to see the rest (photos by Joshua Curry and article by Shannon Darrough and Marimar McNaughton). Thanks again to Elizabeth for tracking it down for me! The sofas are different, but I recognize Victoria’s chair as either being the same or something very similar to one we saw in the pilot. I’ve been excited to watch this show since I saw the first preview, I love Brothers & Sisters, so I had to watch this. I was pleasently suprised when I watched the first show and about flipped when I saw those houses!!! Can’t wait to see what will happen next! Julia, oh yes I am watching and I watch very little television. As you mentioned the homes are so intriguing and the co-stars are wonderful in their roles. It is like a book you don’t want to end when the weeks episode is over! I am watching and I agree with you. It’s better than I expected it to be. I started watching this show strictly by accident and I have to say I’m pretty much hooked on it so far. I was channel surfing and couldn’t find anything else to watch and I’m so glad I landed on this show, I really like it and I love the houses too! In the later pictures of Emily’s house remind me of Mike Delfino’s house on Desperate Housewives, particularly when Katherine lived there. Is it the same set? Well, since they’re still filming in that house on “Desperate Housewives” (the hunky new neighbor lives in it now), I doubt it. But they do look similar, don’t they? I am watching the episode when Tyler kidnaps Amanda. And this is when I made the same connection. It looks a lot like Mike/Katherine’s house. Love Emily’s house…she just seems so vulnerable in it…but after watching what she’s capable of, I’m sure she’s not afraid. Also love the Mary Higgins Clark-esque plot. 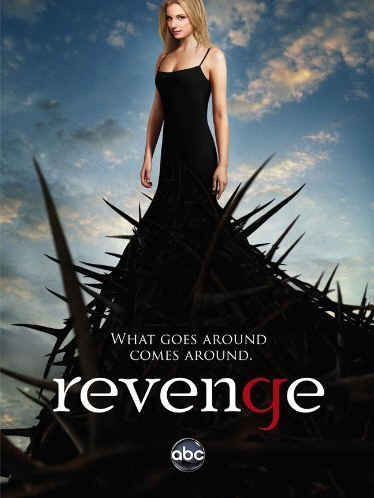 Revenge is turning out to be my favorite of the new Fall shows – of course, I only tried 4 so far, but this is the standout! I like Emily’s house the best, it looks more lived in, and I wouldn’t be afraid to put my feet up and relax. So, the perfect beach house! The Grayson’s is pretty to look at, but not “homey” enough for me. I actually like the littler house better. More cozy. I watched the first episode and then forgot about it. Need to set that DVR! Yes, I am watching. I found myself drooling over the homes, and had to rewind my DVR a few times because I wasn’t paying attention to the actors. I am wondering if this is going to be a one-season show….trying to figure out how they will stretch it out beyond one season. I am hooked! I’m loving this show. Just like everyone else, I knew you had to comment on these houses. Beautiful! I’m so not in the loop! Got to give this a try and watch next time!! I’m loving this show, totally better than expected. And some great real estate tolook at too! Plus, I’m loving the cute little town their shooting in. Wow, Julia, that was fast! Thanks for the great post and especially the link to the actual home. The real-life entry is to-die for and, oh, that great room! Thanks again! The Grayson mansion is so gorgeous. It’s too bad that they changed the spot of the staircase because I like the first one much better. That woodwork in the foyer reminds me a lot like a tudor mansion. The beach house has that vacation home feel to it. I would love to have a vacation house like that. I haven’t seen this show and I probably won’t because I already have enough tv to watch. Thank you for the photographs of these lovely homes. I, too, saw the houses in the commercials and had to watch to get another glimpse. Simply stunning! I’m hooked and will definitely continue watching. Yes, I love the show and the house. I keep forgetting what day this is on. You have to watch Prime Suspect with Maria Bello. It is the BEST cop show I have ever seen. I am loving this show, & the houses are gorgeous BUT, as someone who lives on the East Coast & has been to the Hamptons my big complaint is that the settings looks nothing like what the Hamptons look like! So where is the Hamptons’ mansion located? The one that we see from the aerial view? Not sure but I’m assuming that’s really in the Hamptons somewhere. Does anyone know? Hopefully, someone will know so that we can see whether there are any other aerials and which architect designed it. It’s really nice. There was a nice shot somewhere around 35th minute of the second episode, if you have it, I’d appreciate it if you added it to the photos! Wonderful website! This was the best aerial shot I could get. Very tricky taking screenshots from the ABC website because whenever you try to pause it, it goes to a commercial and takes the photo away. Hopefully we’ll see more of it in episodes to come, though! It’s quite different, but the general style kind of reminds me of these Hamptons houses. I’m so glad you’ve made a post about it! Thank you for sharing all these great informations with us. I’m really liking this show! The show IS much better than I expected. I didn’t see the first show/pilot, but was on vacation last week, and the hubs and I caught the second show. Takes us back to the days of prime time soaps, don’t you think? It has atmosphere, devious plots, and some decent acting – – except for the ‘rich kids’. They’re a bit one dimensional. Oh, yeah, the houses! I’m in love with Emily’s and would take it in a heartbeat. The other is too big, too grand, too much for me – – but it has some very lovely features. Love love love the mansion! It is so fantastic, the woodwork is gorgeous! And the modern and elegant decor is so glamorous. I only watched the premiere, but I am definitely hooked. I will need to set up the DVR for this show. It’s so fun to watch Emily play the “bad girl,” such a departure from her character on Brothers & Sisters. Great post, Julia! Love the houses and the sets (of course I do!) , confess that I am not ready to watch the show yet…. I was afraid that there might be too much murder and mayhem. You all have convinced me to give it a try! There’s another show on the USA channel that is in the Hamptons that also has great scenery and homes, it’s called “Royal Pains” – pretty cute show, even if some of it is really not very believable. I have been LOVING this show and it took me a while to notice this was filmed in Hometown, NC. So excited because we look awesome on the show! I have been trying to place each scene and this helped a ton!! Love the pendant lights in the kitchen and family room of the mansion!!! Any ideas on how to find them? The lighting according to the Wrightsville Beach Magazine WrightsvilleBeachMagazine.com states that the lighting is from Coastal Lighting Supply and Louis Gaskill. I am assuming that Louis Gaskill is the designer of the lights. The home was featured in their September 2011 issue. On the cover of the magazine is a female swimmer with a swimcap and googles. I live in Oak Island and Southport, NC. It is so cool to see these places on TV. My husband and I love the Fishy Fishy Cafe and were excited to see the “Closed for Filming” sign out front. Oh, thanks for doing this post! “Revenge” is deliciously guilty pleasure viewing, you can tell they’re having fun but its also got some heart to it. I was surprised by how much I like it. Part of that is, of course, the scenery. I am so in love with Emily’s beach house. I’ve only seen the NC beaches in pictures, but this so makes me want to move there. (i missed my free visiting chance as my friend just moved from wilmington after 2 years). I love the soft green on the walls inside, it echoes the green you can see on the exterior in the snap of the porch from the pilot. It also has a nice mix of white and soft colors, and the lovely wooden ceiling beams so wonderfully warm the space up. I’m not quite as enamored by Victoria’s mansion, its too large scale for me, but the woodwork is stunning and I do love the kitchen. I live in Southport NC and have loved watching the show.Seeing local spots I go to everyday in the show has been so neat. Thank you for posting this and finding out the information on the houses. I watch each episode a second time for the houses and location shots! I think that there is at least three staircases in the Grayson house. I think the first one you posted (single staircase with glass doors) is actually a back door set, it make sense that the son would come in the back door, and not the front and that Victoria’s bathroom faces the back yard. In the third episode (Betrayal) at 23:57, 25:15 and 35:54 it shows a double staircase and a wooden door which is I think the main foyer because Victoria is welcoming the roommate, talking to the security guy and is sendings guests home from that door and staircase. I think the stairs in the family room area are just one more set in the house. There are 3 staircases! One in the front entry hall, one by the piano and a back staircase that is rarely shown! There is actually nothing on the second floor of the Grayson home set! I built the little beach house in South Port NC that Emily Thorne rents in the show, it is the same design of one that I built on Bald Head Island NC. Oh, wow. I’d love to see some photos of it if you have any you’d like to share with us! I love Emily Thorne’s beach house exterior design. I just told my husband that would be the design I would like for us to build. I would love to see more of the interior design. It’s so comfy, cozy looking from the outside. Does it have a garage? I would love to see the floor plan. I too would like to build a house like that. How many square feet? So, the web led me to you to find out where I can get the bedspread in Victoria’s daughter’s room in the ABC show Revenge. I would love to have it. Do you have and idea where it is available? Correction, my email is as above. Sorry. If I know something, I put it in the post. I have no source info on the furnishings. as much as i love the “grayson mansion” i think it is a photo-shopped house that is actually in the hamptons. looks like they stretched it out, added conservatory, turret and chimneys. if you google hamptons houses, the house they used comes up in images under a blogspot “justnotsaid”. love your blog by the way. Interesting! It could very well be Photoshopped since none of us has been able to track it down. house i think they used is on the corner of further lane and cross highway in amagansett. just stretched it, moved pool and added a few extras. I am in LOVE with this show! It is a nice, refreshing change from all of the cop dramas on television these days. Emily Thorne is an amazing character with her girl next-door charm and looks yet, with her impressive intelligence she’s always a step ahead of her prey. The setting along is gorgeous, I love the beach and also find the show refreshing that it doesn’t take place in a major city. I hope this show lasts because it has my attention, it has since day one! Another question: the house from this magazine, does anyone know where it is located EXACTly (address ) and who owns it? I love this show! And I’m on the hunt for the perfect navy blue wall paint and it just so happens it is in Victoria’s pool house. Anyone have any idea what color blue it is, who it is by or where I can try to find out??? Pretty soon our master bedroom is going to be painted in swatches at the rate we’re going! I am loving this show , we dont get here in Holland yet but Ive found a site online to watch them the next day. The show is written like a book, and the music is wonderful I saw Emily in an interview and she said the next episode (5th) is going to be a good one, something maybe about a double revenge? Im glad my family in Chicago reminded me about this show. We get the E! channle here too , so I had seen the commericals. Thanks Julia for all the great info! sorry now I see… my apologies ..
My favorite new show of season; very high on my must see every week and not taped, live asap… I have all saved on dvr so far; I want more, more. I love the show. Oh my goodness. Thank you. I love this show for the scenery as well as the juicy story! I’m all over that Grayson Mansion. I would NEVER leave my house if it were mine. Love the show & love the homes. Wondering where I can find sheers/drapes like the white ones in Emily’s house. Did you ever find where one could get the sheers? I’m so anxious to know. Finally! Thank you, everyone! I had a suspicion the first time I saw the mansion that it was PhotoShopped. The insistence on only one shot and some other details made me believe it didn’t exist. The correct address is 257 Further Lane, East Hampton, NY 11937. For the best aerial view, choose Birds Eye view from the top menu. The house is L shaped and has a large round driveway. For those of you who are not familiar with Bing Maps, use the + icon to zoom in and get a good view of the mansion. Also, you can use the down arrow to rotate the house and view it from 4 different angles. Finally, note that the house is significantly further from the beach than it is on TV. You can see that this house was used as the basis of the photoshopped version of the house. In the photoshopped version, it was stretched, the turret was added, several dormers were added, etc. Here’s a link to a view of the house which is already in Bird’s Eye format, zoomed, in, etc. You can still rotate this view to see the mansion from 3 additional angles. Here’s a link which has already been zoomed in, put into Bird’s Eye view, etc. You can still rotate the view to see the mansion from 3 additional angles. I LOVE this show !!! =D Julia i am so glad you added it 🙂 LOVE both houses, wish i owned one LOL! My wife said that she thought that she heard someone on a talk show say that they were the owner of the Grayson mansion. Anybody know who really owns it? Wish I’d seen that! I’d love to hear from the real owner. Which talk show? This was made by a prop house just for the show. Love the woodwork, artwork, and pieces of furniture in the Grayson mansion. My favorite piece that stood out is the glass container with the different sea shells in it. The glass container sits behind one of the sofas in the living area. If you know which one I am talking about and know where I can acquire one, it would be greatly appreciated. Thanks for this wonderful post. I too am looking for it and the horse statue on the opposite side. I have looked at a few places but so far no luck. Wish the designers had nothing better to do than tell us where they got everything. haha oh well. Any idea what the name is of the blue and white china Victoria uses on the show? She had coffee in a cup on the episode that aired on 12/7/11. I would like to know this as well. It was absolutely beautiful. I’m am also desperate to find this china pattern. Any information would be appreciated as I have been searching everywhere with no luck. Thanks. Hello to everyone wondering about the blue and white China – please note that this is not a true china set but just a bunch of random pieces picked up at the Sony prop house here in LA. You can all stop killing yourselves looking for the same set as it doesn’t exist. Well what about the cup? Any idea? Any idea how to see floor plans of Emily Thorne’s house??!! Sorry to disappoint but Emily’s house is just a room on a stage, it has plans but it doesn’t actually have an upstairs. What you see on screen is what it is; a kitchen/dining room and a living room with fireplace and a wrap around porch. There are stairs but here bedroom is a set that’s taken down and put up as needed. A floorplan is actually drawn just for set building and built so filming crews can move walls, etc. It would be of no use in practical life! I love the green’ish color on Emily’s interior walls in the last episode. Anyone know what color that is? Thanks! I would love to know the colour of green used on the walls too!!! Love, love, love it! I want to paint my living room that colour. I, too, am looking for that green color paint that is in Emily’s beach house. Anyone have any idea of brand & color?? In addition, I would love a photo of Emily’s kitchen. It’s so appealing and homey!! I have been glued to this show Revenge. The characters play the parts so well. I love the elegence of the homes. I could picture myself there talking to them all. So real! I have never seen this show. However looking at this home(mansion) makes me want to see it. I am also interested in the beautiful vase with the seashells sitting behind Emily on the sofa. I also saw it behind Victoria on last nights show. Can you tell us where to inquire about buying this vase???? 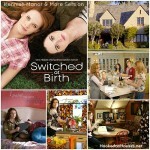 I adore this show!! Is it still filming I saw on internet that they stopped filming it:( i hope thats not true can anybody tell me is it??? 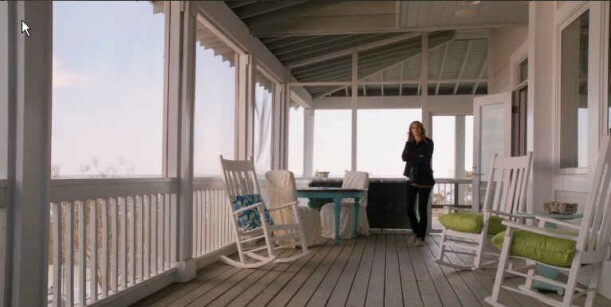 Emily VanCamp should be familiar with Nolan’s beach house. Check out the Season 3 premiere of Brothers & Sisters and you’ll find it serving as Kevin’s boss’s beach house. There’s even a look at (I’m assuming) the house’s kitchen. I love this show, I wish you could do a post about Emily’s bedroom, it’s so pretty too! Also, I have watched the CW show The Secret Circle a few times and I would love to see some pics of the houses on that show, Cassie’s house looks like and American Foursquare style and it’s really pretty, as well as one of the characters named Diana! I love your site! I adore the blue and white china Victoria is sipping tea from in this week’s episode. Any idea how someone would find out where to but that set? I agree, the blue china mug looks gorgeous. I believe there is also a creamer in the scene that looks pretty interesting. Does anyone have any answers on who the maker is? Where it might be available? Hi, this is not an actual “set” of china but a collection of stuff that was rented from the Sony Prop house. Emily’s bedroom displayed the 2 white unique bedside lamps and another mercury type with toile lampshade. Where can we find these? Also, the sofa’s and chair’s in each home, where are these available? I noticed the white bedroom furniture in Emily’s bedroom. Do you have any ideas what company makes it and where it can be purchased? I love the Pendent over the island in Emily’s kitchen but can’t find it anywhere. has anybody had any luck in finding a contact at the show with information on the interior furnishings of the homes? I’m pretty sure that Nollan’s house is also the house of Naomi’s sister from Beverly Hills 90210. Oh, really? I had no idea. I haven’t been watching the new 90210. Yes, you are right, it is the same house located in Malibu, CA! Check out EmilyThorne.org. All episodes with pics. Some show parts of the houses. More fun! It’s been changed all around now so enjoy the hunt! I hadn’t seen that site. Thanks, Joyce!! I’m pretty sure that is the house from 90210!!! I love Revenge, great show! Can someone please tell me the color of Emily’s living room … or even the color of the Grayson’s bathroom? I have been searching everywhere for some info about Emily’s bedroom. I LOVE the bed and am looking to purchase one just like it. Does anyone know where can I get one ? 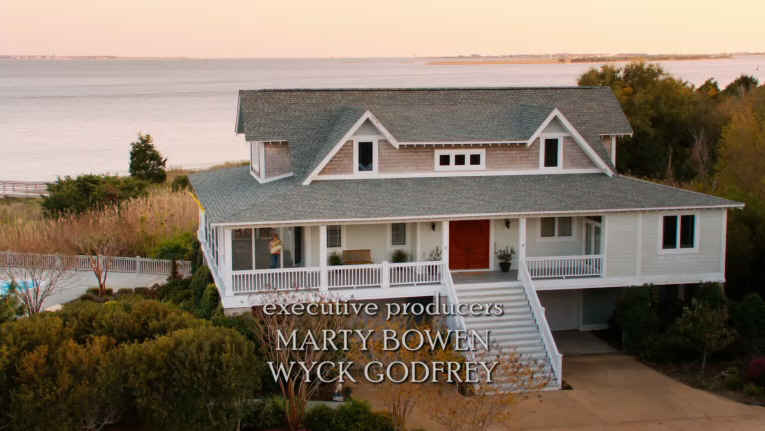 I Love this show and I also love that alot of it is filmed right in my hometown, Southport, NC. I haven eaten at Fishy Fishy several times and it’s fun too see it on the Pilot. 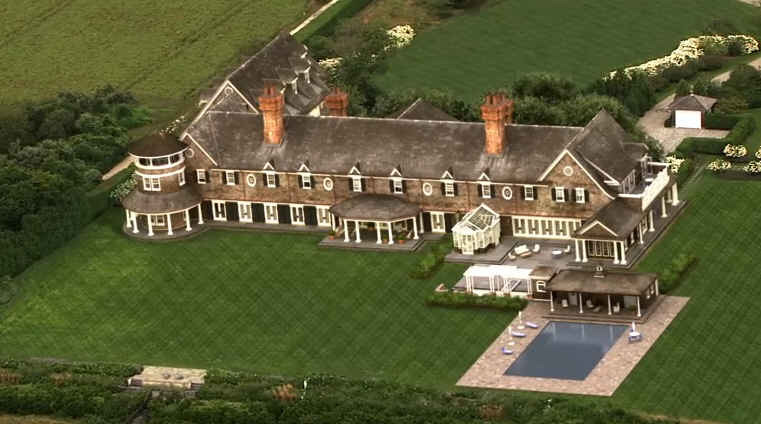 Hello all – I can tell you from the aerial shots that this house is not on Long Island. I lived there for 5 years and have been to the Hamptons…Long Island doesn’t have the “inlets” like you see is some of the water aerial shots – it’s a 100 mile long beach that curves, but no major inlets… it’s most likely NC area where they have many inlets and rivers attached to the ocean… just saying. I just love the movie revenge and the actress Emily Thorn. She is a good actress and the show is great. All my children and relatives like this show and the homes a goregous. Emily’s porch is beautiful and cozy to sit outside at night and in winter also . I hope this show continues on for the longest and has a lot of action in it. If you can let me know in my e-mail when the next show is. Thank you. Julia I need some help. I am from Texas and it’s a small town near Corpus Christi. I was wandering if you know if programs or charity to help people fix there homes. I am sick and I get a small disability check. And my house needs a roof and other things. But I don’t have the money to fix my house and I have been asking around if there’s a program I can get into so I can get grant money or some kind of help. It’s not easy. Can you please help me . I would appreciate it very much. Thank You for listening. And I do love the show revenge and Emily. My relatives and friend see it all the time. This show is addicting. Hi, Maria! I’m afraid I’m not familiar with programs like those. However, I know that many churches have benevolence funds and use them to help people in need. Do you have one nearby you can go to? Ours has helped people in our community over the years who needed a place to live or a car to drive to work, etc. Best of luck to you! I love the black and white chairs in the corners of the Grayson’s living room shown on the Feb. 29 episode. Does anyone know who makes those chairs or where they can be purchased? Thanks! Does anyone know where to locate Emily’s French settee? The Feb 29 episode gave a nice side view of the curved wooden arm. Please help! Does anyone know the name of the blue paint in the pool house? There is no filming allowed in the Hamptons, plus the resources that a large production like this needs are not available in the Hamptons. And LA does a damn fine job of standing in for other locations! The CG is just a cheap way for the studio to save money, the show is not about the aesthetics as much as it’s about the story. Hi Julia, Thanks for the ongoing enjoyment I get from your site.! do you think you could put up some shots of the formal dining room from the scene of the Grayson’s anniversary dinner. I would love to get a better look at that. I was also able to locate this home on Google Maps/satellite view. In addition, photos 6 and 7 on the above link look very much like Nolan’s house. Wow! That’s great. That looks like it–and Nolan’s house, too. Thanks!! Wow! I’ve never watched this show, but what a gorgeous house! I found your site to be very intersting, keep up the good work. I would really like to know the pattern of Victorias Blue and white china..does anybody know as I would liketo buy it. Thanks for your help. So many people are looking for that china! I have no idea, but maybe you could get a screenshot of it, print it out, and take it to the china department in a store that carries the good stuff. Maybe they’d recognize it. Good luck! Just to let you all know about the china, it is a bunch of pieces rented from the Sony prop house here in LA. It is not a true set but a bunch of mismatched pieces. You can all stop killing yourselves looking for it as it does not exist! I am really enjoying this show, and sometimes wonder how I can love such a devious character as Emily Thorne…but the Graysons always prove worthy of her schemes. Having grown up spending summers in Montauk, I was curious at first to see the show’s location; obviously in reality it’s nowhere near. However, while on vacation in NC, it was exciting to discover that the little seaside town of Southport that we were exploring was the setting of many of the scenes in the show. We nosed around Fishy Fishy and got some photos of the interior as well as the scoop from the hostess on all the repainting that the crew did before and after filming. Thanks for all the photos! Trying to find out the name/manufacturer of the duvet cover in Charlotte’s bedroom. Appears to be white with large fuschia flower. Can anyone help? I too have been searching for the blue tea cup Victoria so elegantly drinks her tea. the cup looks so big and luxurious. I am also searching thru all the links provided in the Sept 11 Wrightsville Mag. They list the interior suppliers on the last page of the article. I found the Blue Chair with the black spool looking legs and back. But what I really want is that vase with the shells in it. stunning. it looks like it’s sitting in a stand. I am on my third round watching the episodes on hulu. I see something new each time. Totally the new Danielle Steel type show. Reminds me of Dallas. it occurs to me that these shows are one big advertisement for products, so it would be really great if the producers provided a link to the less obvious ones. We know how to find the cars, and almost always fashionista bloggers provide the dress designers, we just never see the interior furnishings. Flat Round Vase 9 1/2 x 10″ not quite the grand Victoria size, but getting closer to finding this. Love the show. While watching,from PA noticed that some outdoor scenes were shot in Pasadena. My daughter lives there and we go to Abuelita’s for yarn and recognized the street immediately. I was very excited! FOUND IT!!! Victoria’s Tea cup set is for sale at Bombay Company and the name of it is Blue and White Grace. $99 for 4 cups with lids. I took a screen shot with my camera then searched through patterns. Wow! Thanks for tracking it down and giving us the link. That’s great!! Thanks Chardonnay. I’ll be running over there this weekend to pick up a set. Hopefulyy they will still be availble!. Hi, actually all of the tea set stuff you see on the show was rented from Sony prop house, and none of it really matches, it is just a mix of a bunch of different blue and white pottery. Sorry to spoil the illusion! Does anyone have any information about those beautiful blue china cups?? I’m desperate to get a set! Just anything that looks similar! Oh sorry just saw the link above! Any chance of adding photos of the fireplaces in Amanda’s Beach House and the Grayson Manor? Too busy working on new posts to update this one right now, but maybe next season. Haven’t heard of that website but if you track it down, let us know. I’d like to see it! It’s Gilt! They came to the sets and did a walk around with the decorator and picked out specific pieces they liked and wanted to replicate to sell. I’m not sure how far they’ve gotten in that process but you can google them. Hey all, has anyone else picked up that Nolan’s house was also used on Brothers and Sisters Season3 episode 1 Glass houses? Hi, great post, I worked on this show’s first season exclusively with the sets. The pilot was shot in NC and it was re-created on sets in Manhattan Beach, CA. There are locations sprinkled in like Malibu where Nolan’s house is and Santa Monica and Marina Del Rey where the ext. of the Stowaway is shot. The rest is CGI and flyovers of the actual Hamptons. It was not intended to copy the look of the pilot exactly and sets have to be made in consideration for filming crews so it’s not always possible to recreate exactly what you see when you’ve filmed in an actual house. Many of the interior furnishings of both houses were bought in and around LA and Gilt is also doing a feature on Revenge interiors. Anyway, I enjoyed the post, hope this adds a little more info for those wondering! NL, thank you. Do you recall where the shell vase came from? Can you find out ? I am going crazy. The shell vase is just a regular glass vase filled with shells, probably from Michael’s, they sell shells in bulk. I am looking for the iron bed that appears on the set of Revenge in Emily’s bedroom. How can i find out where was it purchased ? The houses are simply beautiful !!! But—I just LOVE the show and can’t wait till it comes back in the Fall !!! BEST show on in quite a very long time !!! I am looking everywhere for the 2 white chairs used in Episode 19. Daniel was interviewed in them. They are also show in the picture above in the ariel view of the living room. They are near the piano. They are white with black wood trim. Would anyone know where to find them? I have found some close but I really want the exact ones. Hey everyone, just wanted to let a bunch of you know that ask for the whereabouts of specific items on the sets: most of the items you see on this show, and all shows really, are rented from prop houses. Shows cannot afford to buy many of these items only to be used sporadically so they are rented, sometimes multiple times throughout a season. The only items that are typically bought are items for the permanent sets and even those are rented sometimes. Also, sets that you don’t see often or just once and a while are typically not permanent sets meaning the go up only when needed and come down immediately after so that stuff is rented. Hope this helps people in their searches, you may not find everything out there that you see on TV because a lot of it is sitting in a prop house somewhere waiting to be rented out! Thanks, NL! That explains why there are so many things people are trying to track down to no avail. Recently read that the prototype for Emily’s Hamptons beach house is up for sale in Southport, North Carolina. In the episode Doubt, Victoria sleeps with an artist. I would LOVE to find his headboard or something like it. I’ve never seen anything like it. If anybody knows anything, please please PLEASE let me know. Thanks! there is a tour of the soundstage, it is HUGE!!! and all kind of fab! Seeing that video made my day. Thanks! I love Amanda’s house but always wonder how it can be so neat and dustr free. She doesn’t seem to have any home help!!!! I have photos of it in the newer post about Grayson Manor that I linked to at the end of this post. I believe that the headboard is from Debra Ryan Signature. It’s likely only sold to the trade. If you want a less expensive option (and with nailheads, not piping) try Ballard Designs. I’ve been sitting here so upset thinking that these homes were flooded from Sandy out in Montauk LI by me & they never stepped one foot on LI. WHY NOT? TOO EXPENSIVE? That’s the reason why I watched the show. It was from here, NY! Hi. Does anyone know where I can find the white duvet/comforter shown in Charlotte Grayson’s room in Season 2 Episode 6 “Illusion”. You can see it about 33:27 min. into the show. Any suggestions would be helpful. Thanks! Try looking at Anthropologie for the bedding. They have several duvets that are very similar. OR Keep a look out for something similar at West Elm for less! I have been following your blog for four years–ever since I tried to track down photos of Kate Winslet’s cottage in The Holiday. You just get better and better with time. I love visiting. It always brightens my day and these “Revenge” pictures are just another reason why. Thanks so much, Julia! That’s so nice! Thanks, Paula! I love this show and love some of the art work. Does anyone have info on the huge blue iris painting in Grayson Manor? I saw it again in this week’s episode and would love a print – certainly can’t afford the painting I’m sure! I was going to ask the same question about the blue paint color in Victoria’s bedroom. Did you ever get a reply? Thanks! I don’t know any of the paint colors. Sorry. No, unfortunately, I haven’t gotten any response on the paint colors. Can you tell me the name and brand of the bedding in Victoria’s bedroom? Hi, I absolutely love the tea set in episode 11 season 2, it’s early in the episode when Emily and Victoria have tea at Grayson manor and discuss Daniel’s interest in Stonehaven as a result of Helen’s suggestion. You get a good look at approx 9:11mins into the episode. If anyone know’s what brand they are or where you can buy them from that would be amazing! Hey thank you so much for taking the time and effort to put this post together. What is the color of Charolette’s bedroom walls on Revenge? Where is the location shown in the aerial view of the marina in “Revenge”. I believe the aerial views were all shot around the Hamptons area. Still looking for the color of the “Blue” paint in Victoria’s house/Charolette’s bedroom. Also looked where I can find Charolette’s curtains in her bedroom. I’m an avid fan of this show and I was wondering if anyone recognises the name of Victoria Grayson’s dark blue and white teacup and saucer? I’ve been trying to locate it without any luck. Let me know if you have any luck. I’d love them too if they can post/courier to Australia! Here is the link. Sorry it took me so long. Can anyone find out if they post to Perth, West Australia ? Love what you’ve done here. Nothing better than sitting down and trawling through location website on a Saturday afternoon while Columbo’s on. Keep up the good work. Can anyone in the USA work out if anyone will post to Perth, Western Australia? GRACE, the cups and saucers are called Grace! would you believe it. From the Bombay & Co – but, they won’t post to Australia. Let me know if anyone can post from USA to Perth West Australia – I would be interested!